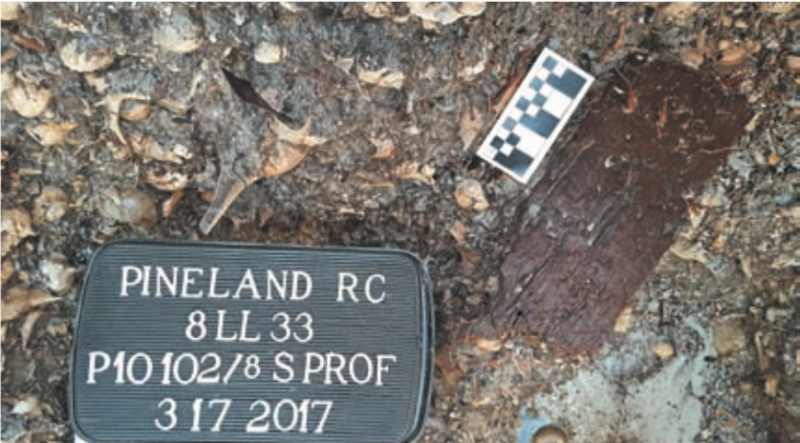 From February 27 through March 11, archaeologists and RRC volunteers excavated at the Pineland site near the corner of Waterfront Drive and Pineland Road, in front of the historic Wilson Sisters house. Our purpose was to investigate in more detail the waterlogged deposits we first encountered in the summer of 2015 when a septic tank was installed on the property. Karen Walker and I were joined by University of Georgia archaeologists Victor Thompson, Isabelle Lulewicz, and Jake Lulewicz during their UGA spring break, March 6-11. 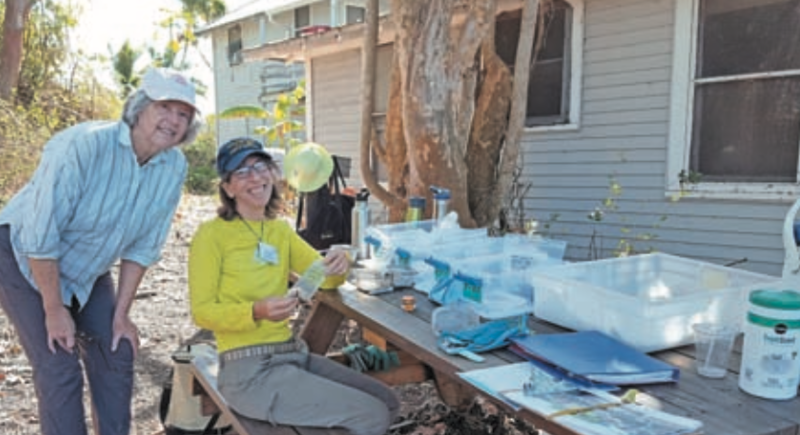 Our paleoethnobotanist colleague Lee Newsom, now with Flagler College in St. Augustine, worked with us March 11-15. Also helping out were FPAN archaeologists Rachael Kangas and Sara Ayers-Rigsby and FPAN internVictoria Lincoln. We opened a 1-x-4-m trench a meter west of the 2015 excavation and soon encountered the familiar shell midden deposit, which quickly became wetter as we excavated deeper. Using a pump, we kept the water under control and were able to recover many normally perishable remains including fragments of cordage and knots from one or more Calusa fishing nets, unburned seeds, and fragments of wood. 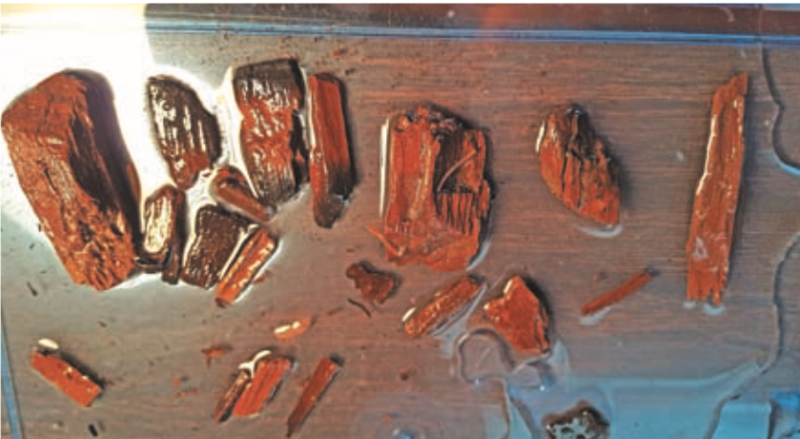 Radiocarbon dates show that these materials, along with pottery, shell artifacts, shells, and fish and other animal bones, had been left behind by Pineland residents on a shoreline between AD 1000 and 1200, then rapidly covered over by more recent deposits, sealing in the old shoreline materials and creating an anaerobic (oxygen-depleted) deposit that favored excellent preservation of organic materials. 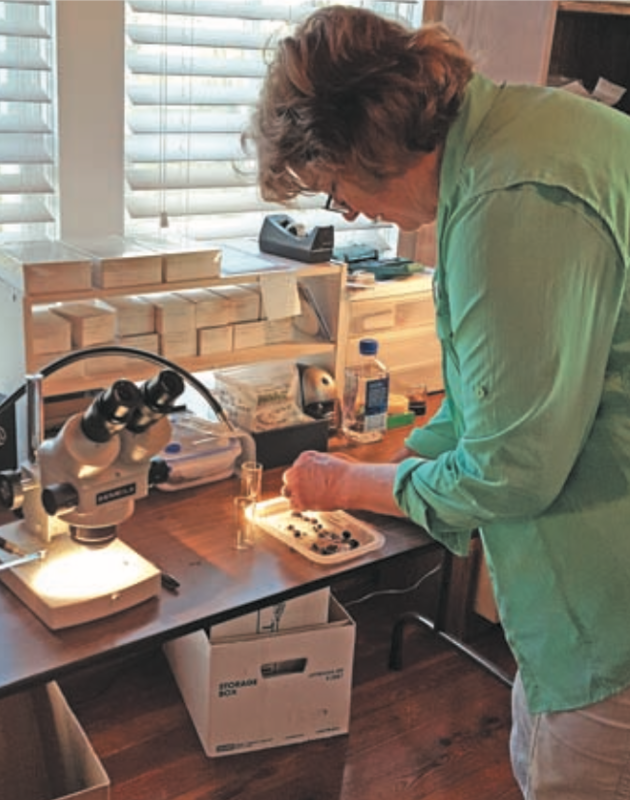 Selected samples from the excavated deposits were water- screened through a series of nested screens by our hard-working volunteers, and are now awaiting detailed analysis by Lee and her students. 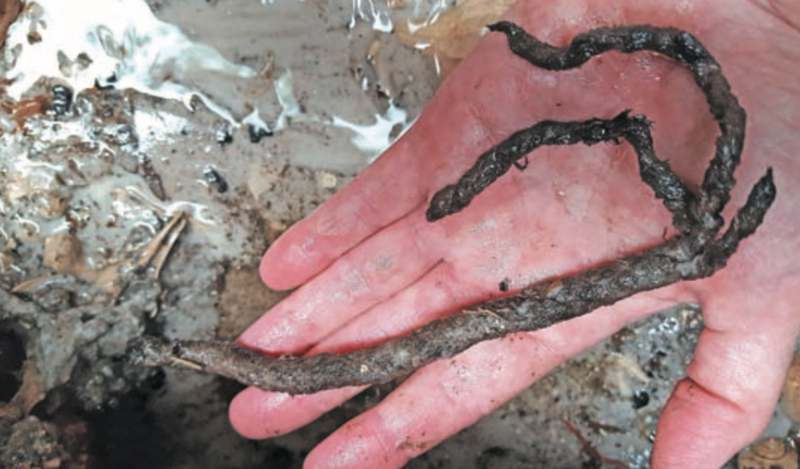 As we wrote in the 2015 article, preservation of such normally perishable materials is quite rare in archaeology, but the Pineland site has now yielded deeply buried, waterlogged deposits at several locations, adding to its overall scientific value. A big thank-you to our RRC volunteers who worked long hours excavating and carrying buckets of heavy, wet sediments to the screens, carefully screening for finds, keeping the finds organized and properly hydrated, keeping records updated, and later water- screening the column samples and cataloging them. We appreciate the cooperation of property owners Crandon, Debbie, and Ricky Randell, who allowed us to excavate on their property. P.R. Smith cheerfully tolerated the daily activity and noisy pump in his front yard. We thank neighbor Lawrence Massey, who used his tractor to carefully move fill dirt from the excavation area prior to our excavations and then place it back over the area when we completed the work. A grant from the National Geographic Society’s Waitt Fund helped pay for travel, field, and lab expenses.